Depending on what browser and resolution you are using, you may find that your content (such as blog posts) which have embedded videos are running over your blog post area. You COULD change your stylesheet, but if everything works except for embedded Youtube videos, an easier answer might be to change the width of the Youtube player. This is super easy to do. First you need to find a video that you want to use. 😉 Not all Youtube videos are embeddable and many copyrighted ones are not. If that is the case, you’ll need to just link to them. If you’re looking at the main user channel, you may not see the embed links, but you can get to them in a number of ways. Click on this get to the video with its embeddable info. The Embed box holds the code for the embeddable video. If you look carefully in the Embed box, you can usually see what the size is — object width is the width that the embeddable video will be. If the pre-configured options will work, you can skip customizing the code; just grab a copy (Ctrl + A) of the code from the Embed box. You’ll be ready for the blogger section then. Click on the tiny star icon (whoa, is that easy to miss!). 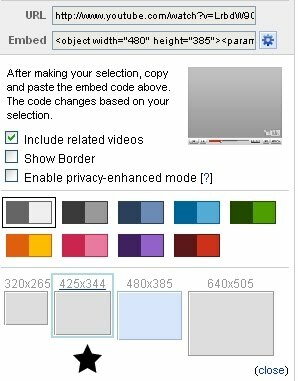 Clicking on this will show you the different pre-configured sizes for an embedded video including size and color for the player. Below the Embed box you will now see a bunch of options to configure your players. Note: Include related videos may or may not include videos from the same user or necessarily on the same topic. If you want to create a group of videos, your better bet is to make a playlist, which can then be embedded. In the Embed box, you will hit Ctrl + A (or right click Select All, if you have that functionality). For Blogger (blogspot blogs) you MUST switch to the Edit Html button in order to embed the video. In any other blog service or product, you will need to somehow get to the html, unless you have embed Youtube functionality. Find a spot in your post where you want to add your video. Now hit Ctrl + P (paste) or right click paste if you have that functionality. indeed, the code from Youtube. If you click on Compose, you will not see the video.Don’t worry, the code is still there and if you click Edit Html you will see the code. If for some reason, you need to edit the width and height even more you can do it by tweaking the height and width even more, directly in the code. ..and that’s how to do it (or at least, one way to do it). I realize this question has probably been answered alot over the ‘net, but it was a question asked to me, so there you go! Very interesting overview of the rise of online video, especially as relates to journalism. Coinciding with the election of 2004 was the prevalence of broadband speeds, and with half of American homes reaching better than dial-up transfer rates, along with all the noise created by the blogs and pundits of the internet, an audience was born, capable and accustomed to online payments (i.e. market potential) and finally able to watch video, on demand by the masses. ..and now we can watch tv online, both episodes from network television as well as original programming. You can read more about it here, including where the numbers come from. 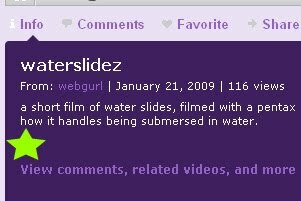 Just in case you didn’t know, Flickr now allows video upload for “pro” accounts. I’m thinking maybe I will keep my flickr account but downgrade it to the free account, and then switch over to smugmug or something else, where I can actually sell photos. I’d also love a place to host both my videos and photos, a flickr + youtube place. Yeah, I have my domain to do that, but I’d like to use a social networking site for that stuff, too. ID is the video’s identification value, SIGNATURE is a value that prevents you from downloading the file just by knowing the ID. I remember seeing a LC project around 1998 or so (tied to American Memory? funny, I can’t remember!) which visually mapped parts of the collections, so that you could see the relationships between items. I’m not sure what happened to that. You are currently browsing the archives for the Video & Audio category.